Planning New Year’s resolutions to rid her life of all things unhealthy, Elizabeth Parker has dumped fatty foods, processed sugar, and her two-timing boyfriend. Indeed, the invitation to join her Aunt Winnie for a How to Host a Murder Party on New Year’s Eve at Winnie’s new Cape Cod B and B comes just in time. But when the local wealthy miser ends up the unscripted victim, Elizabeth must unearth old secrets and new motives in order to clear her beloved aunt of suspicion. The suspects include the town gossip, a haughty rich woman, and an antiques business owner much enamored of his benefactress, a Mrs. Kristell Dubois. If that isn’t bad enough, Elizabeth must also contend with her childhood nemesis, Peter McGowan—-a man she suspects has only matured in chronological years—-and her suspicions about his family’s interest in Winnie’s inn. In Murder at Longbourn, author Tracy Kiely’s heroine Elizabeth Parker is all of twenty-six (and already spinster-ish, at least according to her sister), newly single (due to a two-timing ex) and facing a lonely New Year’s Eve alone. Good thing Elizabeth has an invitation to attend a “dinner-theater murder” themed party at her great-aunt Winnie’s bed-and-breakfast inn at Cape Cod! But when an actual unscripted murder does occur during the party (with dear aunt Winnie as the main suspect! ), Elizabeth teams up with her ex-childhood nemesis (the Darcy-esque Peter McGowan) to solve the mystery (much to the annoyance of the bumbling local police, of course). 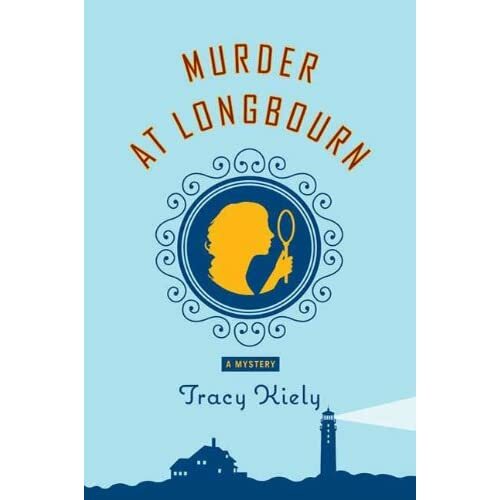 Tracy Kiely’s debut cozy mystery novel Murder at Longbourn pays homage to two of her favorite things – the old-fashioned English drawing room mystery and her love for Jane Austen. As I’ve mentioned, Tracy Kiely even provides a Darcy-esque romantic interest for the character of Elizabeth, plus many of Ms Kiely’s characters are recreated from Pride & Prejudice characters. Die-hard fans of Jane Austen fanfics should be very happy with all the P&P references, but I’m afraid that I didn’t think Murder at Longbourn was as special as my Jane Austen-loving friend (who lent this to me) insisted it was. Yes, I did find it to be an entertaining light cozy mystery with a pretty unexpected (if unbelievable) twist in the end. But I don’t know, my reaction to it was just A’aight, nothing to get too excited about, just another re-tread of an Agatha Christie plot actually if you take away the P&P references… Admittedly, I’m not a particular Jane Austen fan, so I’m afraid all the Austen references and quotes pretty much just went over my head (but my friend who is a huge Austen fan was absolutely charmed and loved it). Another reason I’m not so enthusiastic for this book – it’s probably because I really disliked the main character of Elizabeth Parker. She’s supposed to be this charming firecracker, but I found her to be really unlikable (i.e. rude, obnoxious, petty and immature), and I was pretty much just annoyed with her throughout the book. She’s twenty-six but she doesn’t act it! And none of the other characters (including the love interests) particularly grabbed me as interesting or well-developed either (maybe it was because the author tried so hard to recreate someone else’s characters). Maybe the writing gets better as we go along? (there’s at least two more books in the series that my friend is lending me) But based on this first book, this isn’t really something I’d go around recommending, maybe only to those among my friends who really like book tie-ins to all things Jane Austen. Murder at Longbourn: A Mystery by Tracy Kiely (Macmillan/Minotaur Books) is available on Amazon as a Kindle edition and Hardcover edition. The eBook is also available at Barnes & Noble, Kobo books, Sony bookstore and the Apple iBookstore. Hmmmm…I am a big Jane Austen fan and this does peak my interest. Thanks for the honest review. NOOK Daily Find! Chosen (Lost Books Series #1) by Ted Dekker for $2.89! New Apps for the Kindle – The Little Stick that Could and Poker of the Dead!